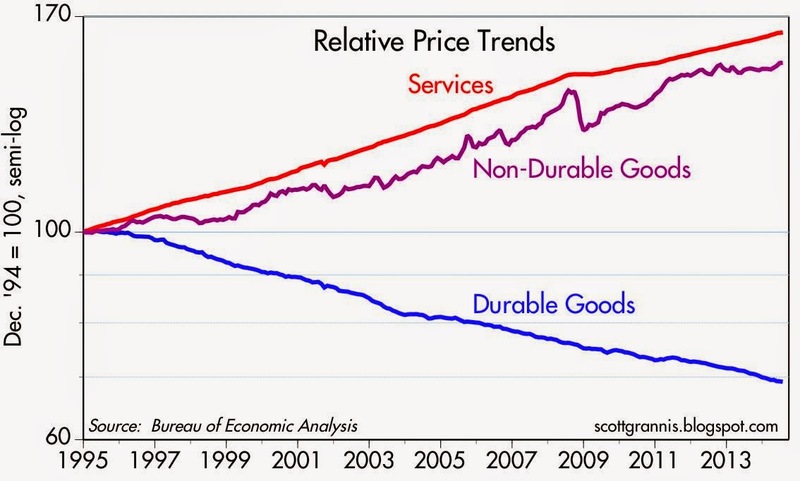 One unique characteristic of the past two decades is the more than 30% decline in the prices of durable goods. Outside of durables, prices of just about everything else have been rising. The decline in durable goods prices began in 1995, which not coincidentally was about the time when China pegged its currency to the dollar (after devaluing it by one third the year before) and launched its export boom. We have China to thank for deflating the prices of most of the durable goods we enjoy these days. That's "good" deflation, since it's not monetary in origin, but rather the result of a huge increase in the productivity of the Chinese economy which has ended up benefiting everyone all over the world. 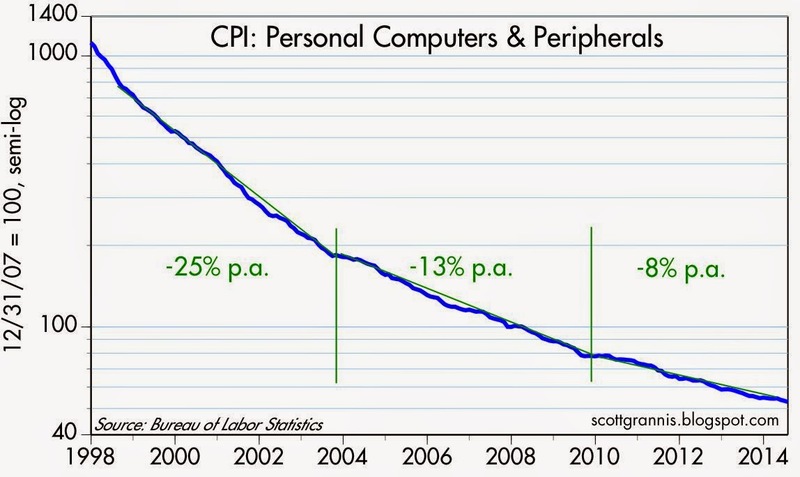 Personal computers are one very obvious source of durable goods deflation. Since the end of 1997, the BLS calculates that the prices of personal computers and peripherals on average have declined by about 95%—which works out to an annualized decline of 16%. Most of this decline is the result of hedonic pricing, which means that although actual prices haven't declined by anywhere near 95%, if you adjust for the increasing quality, capacity, and capabilities of personal computers and such, then prices have effectively declined by 95%. Since 2010, prices have been falling at an annualized rate of about 8% per year. The Producer Price Index was flat in August, but up a little more than 2% over the past year. No sign of deflation here. The dollar's recent 5% rise vis a vis the Euro owes a lot to the fact that the Fed is getting ready to tighten policy, whereas the ECB is trying hard to ease policy further. 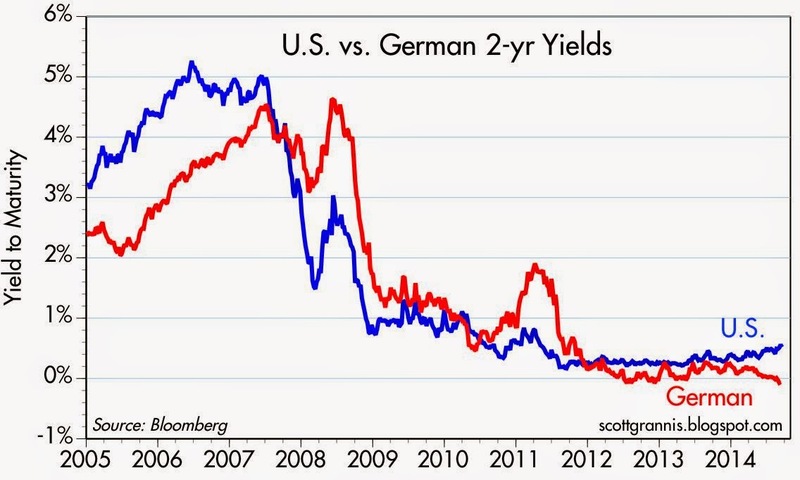 those expectations are being reflected in German 2-yr yields, now -0.06%, and U.S. 2-yr yields, now 0.53%. 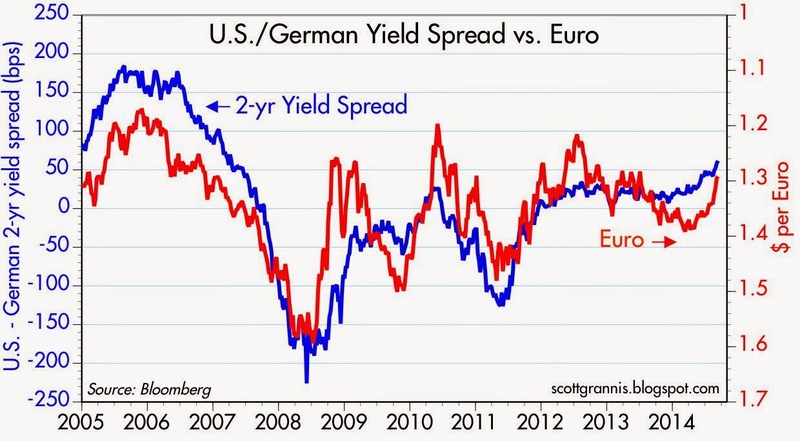 The first of the two charts above shows the history of 2-yr yields, while the second shows the spread between the two and the value of the Euro, which have been highly correlated. The chart above provides convincing evidence for why the Fed is likely to pursue tighter policy than the ECB. 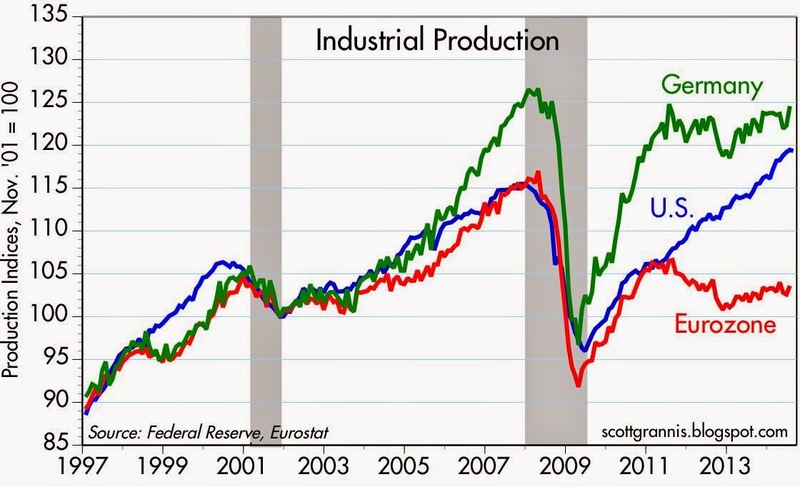 U.S. industrial production has been rising strongly for years, whereas industrial production in the Eurozone has been relatively stagnant. The U.S. economy is fundamentally stronger than the Eurozone economy, so short-term U.S. interest rates are very likely to rise relative to their Eurozone counterparts. The relative outperformance of the U.S. economy has been significant, and is reflected in equity prices. 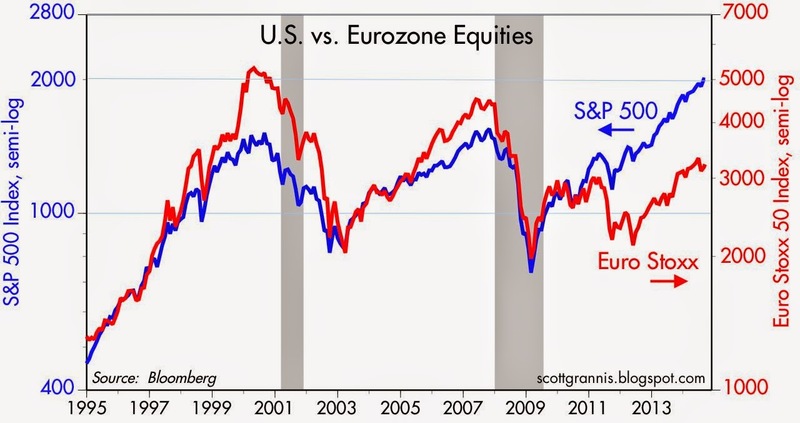 The S&P 500 has outpaced the Euro Stoxx index by 68% over the past five years. U.S. equities now have the added advantage of a strengthening dollar. 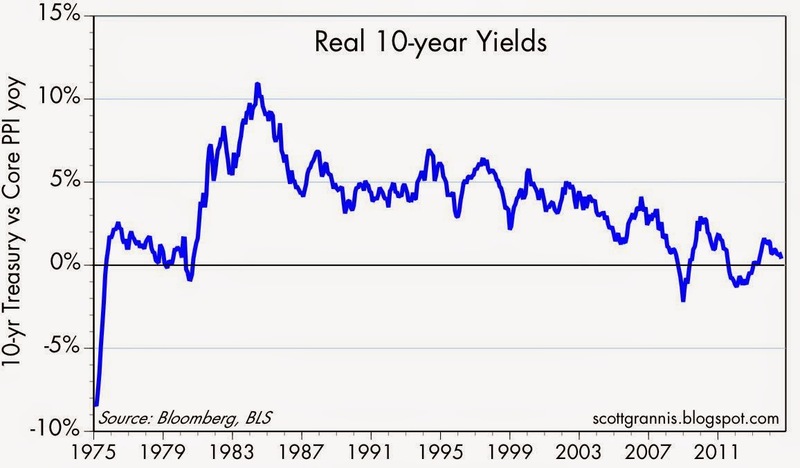 As measured by the difference between 10-yr Treasury yields and the level of Core PPI inflation, real yields have been in a declining trend for the past 30 years. This means that, in general, the effective cost of borrowing money for U.S. businesses hasn't been this low since the late 1970s. This is one reason why companies like Apple are borrowing money here to fund dividends and buybacks instead of repatriating overseas profits. Borrowing costs almost nothing, and they avoid double taxation on foreign profits. Why are assets (such as equities, house appreciation) not included in inflation metrics? I know "rent" is part of cpi calculations but does it not make sense to include inflation in the price of bonds, equities, houses and other financial assets to better capture inflation. To me it seems that the average person need to "save" for retirement by dollar cost averaging in risky assets which is a real cost like medicare insurance or food or other goods. Let us hope the USA can avoid the tight-money ZLB follies of Europe and Japan. The point of macroeconomic policies is prosperity, something the American left, and the American right, have forgotten. Jeff: Reasonable people can argue about what could and should be included in measures of inflation. Traditionally, asset prices, especially equities and bonds, have not been included, and I think that makes sense. 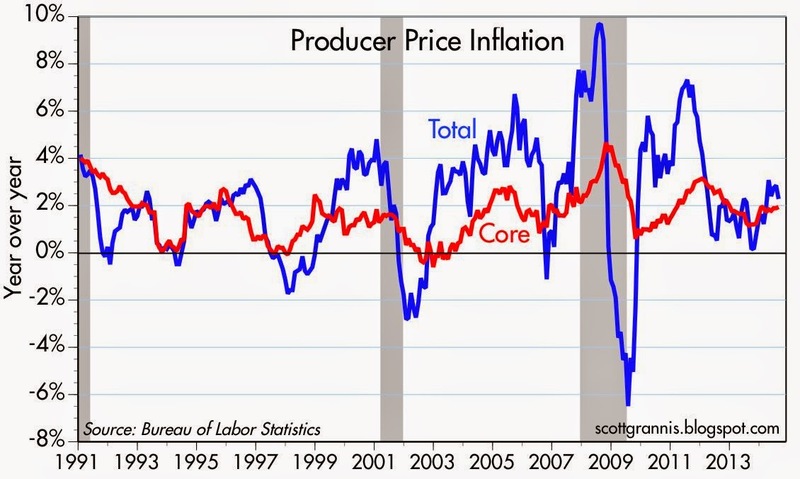 Bond prices typically rise/bond yields typically fall when inflation falls. That's because inflation is a major determinant of interest rates. By the same logic, bond prices typically fall/yields rise as inflation rises. So including bond prices doesn't make much sense since they would reduce reported inflation when it was rising, and increase reported inflation when it was falling. Equity prices are notoriously volatile, even when other prices are relatively stable, so introducing them to a measure of inflation would make reported inflation more volatile. Equity prices are determined by a variety of variables: economic growth, corporate profits, and expected future interest rates (which are in turn used to discount future cash flows). Economic growth is a big factor in equity prices; stronger growth typically leads to higher equity prices, and stronger growth is not typically associated with rising inflation. Adding equity prices to an inflation measure would therefore tend to artificially boost inflation when the economy was healthy, and reduce inflation when the economy was sickly. Economic growth does not correlate positively with inflation, so it makes little sense to add equity prices to a measure of inflation. Countries with very high inflation typically have very low rates of economic growth, whereas low and stable inflation is generally consistent with relatively strong growth. Housing prices feed into the CPI indirectly, since housing prices tend to correlate positively with rents with a lag of about 18 months. Great answer, thanks for the info. I wonder if the following thought is "economically" correct (reasonable people will disagree about whether it is reality or not, but that not what I am asking), is it possible that because inflation measurement in asset prices is very difficult to determine that much of the inflation people fear from recent Fed activities is hidden in inflated asset values, and thus our inflation has outpaced the CPI dramatically just in a places it is not being measured? It would seem to me that inflation is best defined as too many dollars, and what they are chasing is not relevant, and so defining inflation simply as too many dollars chasing too few goods is an incomplete definition. It is certainly possible that the rising prices of some assets (e.g., art, houses, luxury watches) presage a higher level of overall inflation. Long ago I thought that gold prices above $500-600 would be a signal of higher inflation to come, but it hasn't happened yet. I've looked at and considered lots of alternative indicators and measures of inflation but I haven't yet found an inflation measure that is superior to the PCE or GDP deflators. They seem to do a pretty good job over time. Good conversation here. The reason I asked about this is that we can no longer invest in say savings, CDs or bonds and expect to receive a "fair" return to keep pace with inflation. Maybe the days of higher yields on savings are from a bygone inflationary era but for seniors with limited assets they are forced into riskier ask to keep pace with inflation. I speaking for my mother in this case. I suppose if inflation remains subdued at 2% then its not a big problem but I don't really like having to put her too many "riskier" assets. Jeff: there's no doubt that the Fed's policy stance has made things tough on savers. A savings deposit that pays zero becomes a money-losing investment in a 2% inflation environment. Saving money in a traditional bank savings deposit is almost guaranteed to produce a loss of purchasing power. To understand this correctly you need to understand that the demand for "safe" assets has been intense until recently. The world has been willing to pay a huge price (in the form of a minuscule yield) for safety. At the same time, risk aversion has been intense and has led to a big deleveraging, which has amounted to weak loan demand. Savers are very willing to save, but borrowers are not very willing to borrow. Result: zero interest rates. If you run with the herd you will get almost nothing in return. Today's environment indeed encourages people to "reach for yield" and invest in riskier assets in order to receive a reasonable return on investment. If someone is unwilling to invest in riskier assets, then the only recourse is to hope and pray that the Fed boosts short-term interest rates to a more reasonable level starting some time next year. Otherwise the holders of traditional savings accounts will be effectively transferring a part of their wealth to the government, which is the largest motivated borrower these days.